The story of Erwin Rudolph's career as World Pocket Billiard Champion was featured in an article in the Summer, 1991 issue of the "Sayre Quarterly" written by our own Duane Hunter. In preparation of the 1991 article, Duane interviewed Mr. Rudolph's widow, the former Anna Gauss, and recorded, not only Mr. Rudolph's career, but also a glimpse of his personality and his life in Sayre. The article, "A Lifetime of Memories," mentions that Mrs. Rudolph still lived at 224 Desmond Street, in an apartment over the former Recreation Alleys. Recreation Alleys was the billiard parlor purchased by Mr. Rudolph after his retirement from billiard competition 1952. Anna Rudolph recently passed away and the Sayre Historical Society was fortunate to receive many pieces of newspapers clippings, photographs and magazine about Erwin Rudolph's career from Anna's family. This article will only touch on Mr. Rudolph's vocation since Duane's 1991 article was very comprehensive. Instead, we will share some the the extensive treasure the Society has just received. For those who are unfamiliar with the name Erwin Rudolph, a little background information. Erwin Rudolph was born December 20, 1893 in Cleveland, Ohio. In his early years, Erwin started as a musician, taking lessons at the age of 7 from his father who was a violin teacher. During his early adult years, Erwin played violin in a Cleveland movie orchestra. 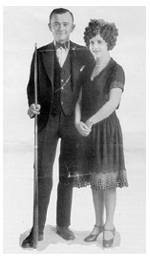 He became interested in pocket billiards, and became one of the great billiard players of the world. He was World Champion in 1925, 1930, 1933, 1934 and 1941. Rudolph's ties with Sayre, PA started with his marriage to a local Sayre girl, Anna Gauss. Erwin met Anna at a local store while he was in town to play an exhibition game. They were married in Chicago on November 10, 1921 and made their home here after his retirement in 1952. According to an article in a 1957 issue of the "American Billiard News" magazine, Erwin Rudolph was "the picture of the gentleman in the 'gentleman's game'. . .he was courteous, kind, a strong competitor, well liked by his opponents." He served his country as a member of the infantry in World War I. During World War II, he toured the country for four years, entertaining at Army and Navy bases. His famous trick-shot act and exhibition matches must have been an excellent morale booster for the servicemen. In June of 1948, Mr. Rudolph invited his long-standing opponent, Ralph Greenleaf, to Sayre for a two-day exhibition game. The exhibition was held at the Sayre High School gymnasium. 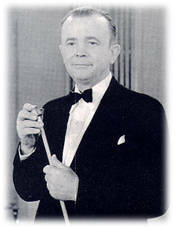 Greenleaf, who was from Burlington, New Jersey, had been crowned World Champion in pocket billiards nineteen times. Mickey Shamot, local sport's figure, was the referee and scored for the match. One June 15, Erwin Rudolph emerged as the victor. Between visits to his fishing camp in Brainerd, Minnesota, and golfing, Erwin Rudolph made Sayre, Pennsylvania, his home. He died in the Robert Packer Hospital on Sunday, May 19, 1957, where he had been admitted the previous Wednesday. He is buried in the Tioga Point Cemetery in Athens, PA.
Rudolph was posthumously inducted into the American Billiard Hall of Fame in Louisville, Kentucky. For those interested in reading Duane Hunter's article, an in-depth record of Erwin Rudolph's billiard career and life in Sayre, a limited number of back issues of the Summer, 1991 "Sayre Quarterly" are available. The cost is $2.50 plus .80 postage per issue. This article was written by Mary Lou Palmer and appeared in the Summer, 2000 issue of "The Sayre Quarterly".